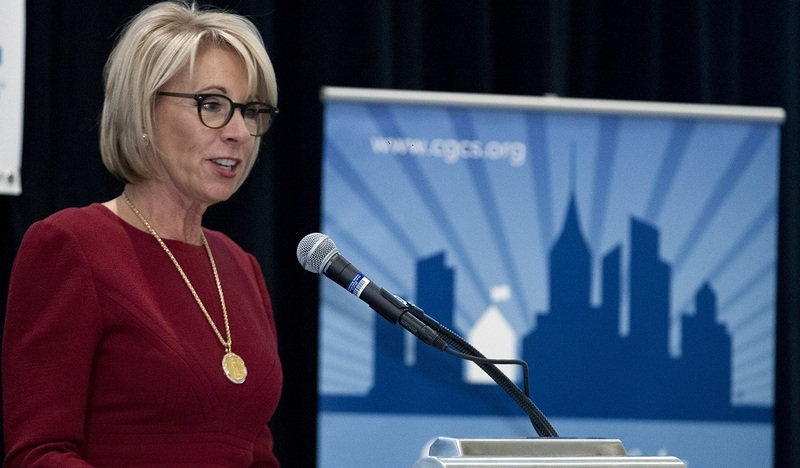 It’s time to rethink our education priorities in America, Education Secretary Betsy DeVos said in a speech on Wednesday at the Brookings Institution. DeVos made her remarks during the release of Brookings’ fifth-annual Education Choice and Competition Index (ECCI). The index ranks America’s largest school districts based on the accessibility of their school choice options. This year, Denver topped the list for school choice availability. Brookings cited Denver’s centralized school assignment system, a school choice website that enables parents to compare schools side-by-side, as well as its open enrollment program as reasons for its ranking. While public schools still serve the vast majority of schoolchildren in this country, lobbying by school choice advocates as well as state laws that create private school voucher and tax credit programs have contributed to a steep increase in educational options for students and parents. U.S. charter school enrollment increased by 62 percent over the previous five years, according to the National Alliance for Public Charter Schools. But many in public education still don’t have a system for tracking students and families who leave for local alternatives—or, a system for winning them back. To DeVos and others, school choice options are disruptors meant to shake up the status quo. In her speech to Brookings, DeVos likened the school choice movement to the ride-sharing service Uber, reports the New York Times. On the other hand, she said, traditional public school advocates who oppose school choice are akin to the taxi-cab industry. “In both cases, the entrenched status quo has resisted models that empower individuals,” she told the audience. Want more on how to stay competitive? Read Dawkins: Embrace school choice. Level the playing field. DeVos’ equating teachers and students to cab drivers and riders didn’t go over well with public school advocates, such as the American Federation of Teachers. Regardless, her remarks provide yet more proof that public schools are entering a new era of choice and competition. What do you think of DeVos’ remarks? What steps are your schools taking to stay competitive in the face of choice? Tell us in the comments. 1 Comment on "DeVos doubles down on school choice"
Frankly, there are points to school choice, WITHIN PUBLIC SCHOOLS. Taking money out to support those who already have chosen private education will deny those choices to the very people who need it. By the way, a 62% increase in charter schools is not much of a positive due to their small numbers. Also, the failure of for-profit schools is karmic. There should be no profit made from the basic running of schools open to any student, public in my definition. The type of competition that the voucher people want doesn’t work with schools as the profit incentive is opposite of the intent of a school, unless, of course, you find a way to measure(without cheating)the real productivity in the minds of the students.